Good point. I bet the answer is tons. And sure enough, I started writing Introduction to Web and Mobile Development for Startup Founders ~4 years ago with Backbone.js and Embedded Coffeescript templates (Eco) in mind. I had just built some single-page apps with this front-end stack and was jazzed about it. I'm now, however, in a position where I need to update the advice I give myself and aspiring startup founders regarding a go-to software stack. Modern web applications need a way to push information to web browsers (chat, notifications, live updates, reloads after deployments, etc.). Back in the day I remember wrestling painfully with various not-well-supported PubSub and WebSockets solutions, but now with ActionCable in Rails 5+ the development process is amazingly easy (seriously, here's a quick demo I put together). 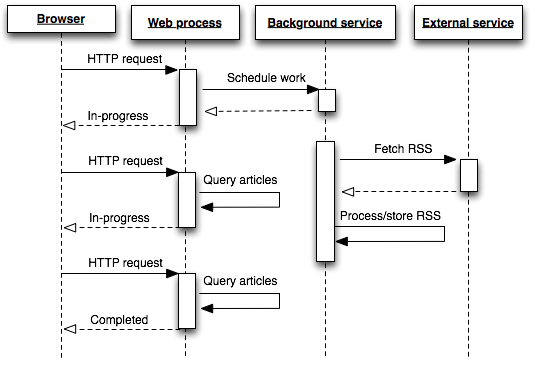 You can imagine how attempting to do all this work in the web process would be a slow experience. Before ActiveJob, Rails developers were left to hack together their own solution (full of gotchas like not being able to send an ActiveRecord object to the job). But now we have a built-in solution that will perform background jobs for us in memory, which is nice for the very-early-stages of a startup that doesn't want to pay the additional hosting cost of background workers. ActiveJob then easily supports queuing solutions like Delayed Job or Sidekiq/Resque with Redis as needed. Redux is a game changer. If you've ever wrestled with massive technical debt in front-end-heavy web experiences, especially as it relates to containing and controlling state, then you can appreciate why a solution like Redux is important. In addition, being able to use the same paradigm across server-side and native experiences is a serious win. And live code editing combined with a time traveling debugger never hurts. Manipulating the Document Object Model (DOM) becomings increasingly painful — and slow — as your application grows and you encourage users to stick around and interact with a single page. Facebook engineers and an army of open source developers are the force behind React, which is simply a User Interface (UI) library (not to be confused with frameworks like Ember or Angular). It's a beautiful thing to be able to use pure React to build presentational components (i.e. state-agnostic, they just do what they are told), and React-Redux “container” components that handle updating and feeding the presentational components. Learn more about this by reading Dan Abramov's article Presentational and Container Components. React Native is a serious game changer in the market of meta-level mobile frameworks. While many people lump it together mentally with Appcelerator/Titanium, Phonegap, Xamarin, Ionic, etc., React Native is fundamentally and powerfully different. The way it approaches native components, asynchronous execution, touch handling, styling, polyfills, and — perhaps most importantly — its extensibility (i.e. you can literally create modules in ObjC/Swift for iOS and Java for Android as needed) is unparalleled. Plus, Facebook “uses React Native in multiple production apps and will continue investing in React Native”, which is hard to beat with other app frameworks, and they've cleaned up their licensing/patent issues. Also, Redux plays very nicely with React Native, and many of the people working on React and React Native are literally on the same team. If you look at the top React contributors and React Native contributors, you will see some of the same people on both lists. And if you think betting on Facebook as a foundational supporter is a bad idea, take a look at their stock price over the past five years and where they are heading with their business and products. Like it or not, for the foreseeable future they are a pretty safe bet. Finally, the Rails community and React community are both amazing and have published a ton of gems and components to speed up engineering. More than ever before, web and mobile development involves knowing what pieces are out there and how they fit together. While of course understanding the nuances of what happens closer to the metal is beneficial, you can get away with being an excellent web/mobile developer without being an expert in Computer Science because of the code out there that is already written for you to use. Plus, when you need help, Google searching and the variety of forums out there (mostly notably Stack Overflow) are quick to provide guidance. I've been profoundly impressed with the resources and people available to lend a hand over the years (i.e. I have many people to thank). In conclusion, the Rails 5, Redux, React, and React Native stack is, in my opinion, a solid choice for startup founders to consider as they work on spinning up new projects. Of course, there are tons of topics within these worlds that I didn't talk about (e.g. Rails 5 has a nice API-only mode now), and at the end of the day it's safe to go with a scalable stack you know well (as long as it has plenty of talent available to work on it) because validating and executing the ideas to grow your business is vastly more important. That being said, there are a bunch of frameworks and packages/libraries/patterns out there that are maturing quickly, and I think the day of recommending JS solutions over Rails for new founders will indeed come at some point. Even then, however, I'm confident that previous teams that stuck with Rails won't be disappointed. Author's note: my main writing projects at the moment are books about idea-to-funding startup operations and web/mobile development for aspiring technical founders. Feel free to subscribe to my newsletter and I'll let you know when I get new content up. Thanks!